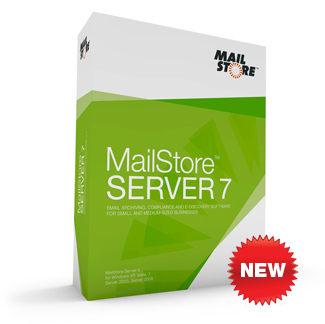 Today we are very excited to announce MailStore Server 7. 64-bit Support – The MailStore Server Windows service now runs natively as a 64 bit process on 64 bit platforms. There is still only one setup application. Setup decides whether to install the 32 bit or 64 bit version of the service. Archive stores have names which are independent from the directory they are stored in. Archive stores are independent from the master database. In fact, they can easily be detached and reattached on a different server. Archive stores can be temporarily disabled rather than having to be detached. Archive stores can place their metadata, contents and search index parts in different directories on separate volumes. Archive stores can handle much larger folder structures than the file groups from MailStore Server 6, making them much better suitable for larger installations. Microsoft SQL Server Support – MailStore Server can store metadata and (if wished) contents in a Microsoft SQL Server database. We support SQL Server 2005, 2008 and 2012. PostgreSQL Support – MailStore Server can store metadata and (if wished) contents in a PostgreSQL opensource database. Better Microsoft Exchange Web Services (EWS) Support – Much better error handling. Client throttling support (avoiding “EWS 500” and “ErrorServerBusy” errors). Multithreaded Multi Mailbox Archiving – Multi-mailbox archiving can now be spread over multiple threads (e.g. 5 or 25), making it much faster and more interesting for larger companies. First-class support for IceWarp Email Server – Multi-mailbox archiving, multidrop (Exchange Journal-like) archiving, synchronization of the user database including groups support. First-class support for Kerio Connect E-mail Server – Multi-mailbox archiving, multidrop (Exchange Journal-like) archiving, synchronization of the user database including groups support. New Generic Multi-Mailbox Archiving – For all other e-mail servers. Based on SASL authentication (RFC standard). Users can now be renamed. User archives can now be renamed. Emails and folders can now be moved between user archives. It is now possible to set privileges for multiple users in one step. API (Application Programming Interface) – Provides a complete set of commands for managing archive stores and users. VSS Writer – MailStore Server now includes a VSS writer which makes backup easier and faster in some scenarios, and dramatically reduces downtime during backup to a few seconds. MailStore Server Startup Script – You can now provide a startup script (batch file) to make it much easier to use MailStore Server together with Network Attached Storage (NAS). New UI Design based on our new Corporate Design – We integrated our new logo and adapted the whole software to our new corporate design.